Enviro-Vac, specialists in risk-assessments for hazardous materials abatement, plant dust-downs and industrial vacuum services for over 40-years. Our highly qualified cleaning technicians matched with grounded vacuum loaders rated for combustible dust, PPE and procedures, deliver safe and secure combustible dust removal solutions. There are a number of critical steps and procedures involved in a safe combustible dust removal program. Enviro-Vac offers a comprehensive range of reliable, proven, industrial and in-plant maintenance service solutions that minimize risk and deliver total peace of mind while staying on time and on budget. Risk-assessments are a regulatory requirement and a proper risk-assessment of work areas allows maximum combustible dust removal - SAFELY. Safety is our number one goal for your company and ours. We work in close compliance with WCB & OSHA Standards. When dust becomes airborne it settles on surfaces throughout facilities. It is believed that 1/32 of an inch (the size of a paper clip) of dust covering more than 5% of a room’s surface can cause an explosion (there are variations to this rule of thumb depending on a number of factors). In order for an explosion to happen, a “fire triangle” must occur. Dust is one element; the other elements are oxygen and an ignition source. When combined with other factors, these elements mix and can cause a “dust explosion pentagon”. The most dramatic hazard associated with dust is secondary explosion and dust explosions. Throughout Canada and the USA these accidents are more common than many people realize. 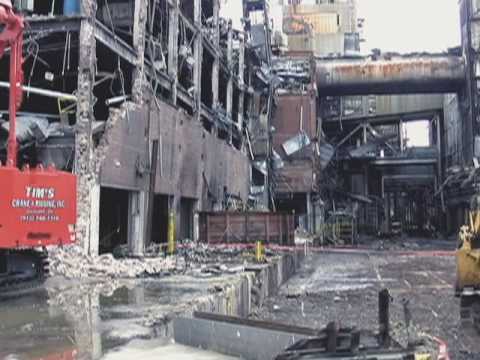 Cleanup or “plant dust down” of combustible dust, also known as explosive dust, is a required preventative maintenance program in manufacturing and production facilities. Combustible Dust has been fueling tremendous explosions and fires throughout Canada that could be avoided. In many accidents, employers and employees were unaware that a hazard even existed. Enviro-Vac service technicians are highly trained and have the experience and know-how to tackle the challenges of combustible dust cleanup. Utilizing appropriate PPE and state-of-the-art technology our CSO’s and COR Certified Health and Safety personnel work with a client’s Environmental Health and Safety department and engineering staff to develop a plan to complete even the most challenging cleaning projects on time and on budget. Metals (e.g., aluminum, chromium, iron, magnesium, and zinc), and fossil fuel power generation. With each industry there is different type of dust. It is important to risk-assess and recognize what type of dust is found in each facility and whether it is listed as an explosive dust according to WCB or OSHA. Some require much more serious management than others.